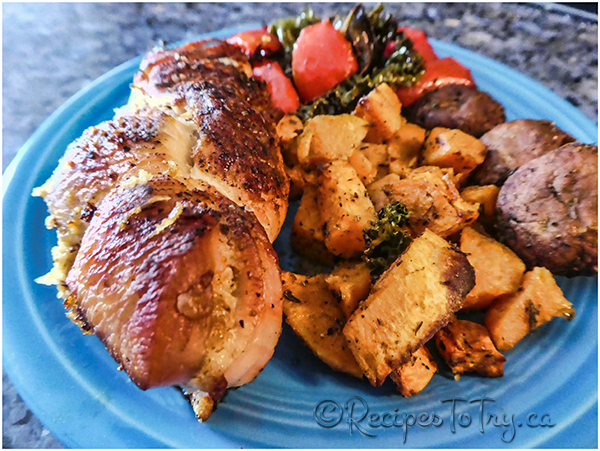 This Turkey Roll has a spiral of herb-laced dressing on the inside making it flavorful and moist. . No need to make a side dish as this one-pan meal has the yams, and Kale roasted with the Turkey Roll. Even though the recipe is written for the Cuisinart Convection Steam Oven; the Regular Oven Directions are given in the Notes section at the bottom. In a small bowl, combine marjoram, thyme, sage and rosemary. Set aside. In a medium skillet on medium, add bacon and onion and cook, occasionally stirring, for 8 to 10 minutes, until onion is translucent and very soft. To a large bowl, transfer bacon-onion mixture along with cooking juices; add Panko crumbs, cheese, ¼ tsp pepper, ¼ tsp salt and all but 2 tsp fresh herb mixture or ¾ tsp dried. Set crumb mixture and remaining herb mixture aside. Arrange 1 turkey breast fillet on a work surface. Using a long, thin knife, cut almost entirely in half parallel to work surface, leaving one side attached. Repeat with remaining breast fillet. Open both fillets like a book and arrange side by side. Arrange crumb mixture on both turkey fillets, leaving a ½-inch border. Starting at one short side, roll into a log. Use kitchen string to tie at 1½- to 2-inch intervals. Sprinkle with remaining 2 tsp herb mixture, ¼ tsp pepper, and ⅛ tsp salt. Arrange turkey, seam side down, in the roasting pan. Fill the balance of the space in the pan with the chopped yam and chopped Kale and Red Pepper. Place in Cuisinart Steam Oven middle rack set Oven to Bake Steam 400° F and 25 minutes or until an internal thermometer inserted into the centermost part of a roll reads 165°F. Remove and let rest 5-10 minutes. If you do not have a Cuisinart Convection Steam Oven follow directions in the Notes Below. In a small skillet add ¼ cup chicken broth, ¼ cup apple cider or unsweetened apple juice bring to a boil. Whisk in the cornstarch-water mixture and cook over medium heat cook until thickened and smooth about 60 seconds. Season with salt and pepper. Serve sauce drizzled over the turkey rolls and veggies. Preheat the oven to 400° F To the roasting pan, add ¼ cup broth and 2 Tbsp apple cider. Transfer to oven and immediately reduce heat to 375°F. Roast for 30 minutes. Baste turkey with pan juices. Continue roasting and basting, until an internal thermometer inserted into the centermost part of a roll reads 165°F, (NOTE: If the pan gets dry, add broth or water to maintain ¼ inch liquid. Remove from oven and let rest, loosely covered with foil, for 5-10 minutes. Meanwhile, place roasting pan on stove top, straddled over 2 burners if necessary, and add remaining 2 tbsp. Apple cider. Bring to a boil on medium, scraping up any browned bits in the pan. Whisk in cornstarch mixed with water mixture and cook until sauce is thickened and smooth, 30 to 60 seconds. Season with additional salt and pepper.